As I'm sure you could guess, the last year has been.... well... there are a lot of words for what's it's been, but today I'll just go with 'busy.' Some days of course are busier than others, and on those days, I like to turn to my trusty crock pot. A penny's worth of work for a dollar's worth of dinner is my kind of cooking on busy days. The problem I used to run into, however, is that so many crockpot recipes use processed ingredients and convenience items. I personally just try to avoid using those things, so I pretty much had 3-4 recipes that I made regularly, and didn't use my crock pot much outside of that. That is, until two years ago, when I bought Slow Cooker Revolution. 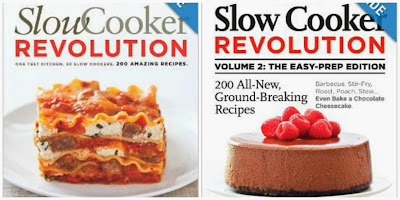 This cookbook really is a 'revolution,' and I haven't made a single recipe out of there that I wouldn't recommend. It has a great variety of dinners - everything from soups, stews, and chili, to roasts, breakfasts, and even some pasta dishes. I have made several things out of the cookbook, including the Loaded Potato Soup, Farmhouse Chicken and Corn Chowder, Tex-Mex Chicken Stew, Chicken Stew with Sausage and White Beans, Tequila-Lime Turkey Chili, Smoky Sausage Chili, Bolognese Sauce, Chicken and Mushroom Sauce, Tex-Mex Stuffed Peppers, Sloppy Joe's, and Irish Oatmeal with Bananas. And I still have a list of about 30 more recipes bookmarked to try soon. Their latest edition is touted as being "The Easy Prep" Edition. One of the goals of this cookbook is that it takes less than 15 minutes from the time you begin assembling ingredients to the time you press 'start' and walk away. It has some great recipes, and I've already made the Spanish Chicken and Saffron Stew and the Three-Bean and Beef Chili, and both are awesome. It also includes some unconventional crockpot recipes, such as ideas for appetizers, veggies, and even some desserts. I'm definitely looking forward to exploring it further in the coming weeks. So who wants to win a copy of both of these cookbooks? I'm giving away the Two-Book Set! All you have to do is leave a comment telling me your favorite crockpot dinner. Giveaway closes Sunday, October 20th at 11:59 pm. Winner will be chosen by a random number generator. This giveaway is sponsored by me! I really love these cookbooks, and just wanted to share the love. I like pulled pork from a crockpot! We love to make chili in the crockpot!! My favorite crockpot recipe is your Chicken Stew with Sausage and White Beans! My family loves it! My favorite crockpot recipe is pulled pork. I love pulled bbq chicken in the crock pot...low and slow and so delicious! I made lentil chili in my crockpot all the time when I lived in Libya - the only things I could reliably access from my locked-down compound were tomatoes, onions, and lentils, and I used spices I smuggled in to amp it up. Yum! My favorite crockpot recipe is pot roast w/ veggies. Would especially love to try the Easy-Prep recipes!! Tex Mex Chicken and Pinto Stew! I love making chicken tacos in the crock pot!!! I've never made a crockpot recipe, but i'd love to! My favorite is your loaded-potato soup. My favorite dish is pork carnitas! It's not dinner, but my favorite crockpot recipe is overnight apple steel-cut oatmeal. Yummm! I love, love, love pulled pork in the crockpot! My fave crockpot recipe is dr. pepper pulled pork. My favorite crackpot recipe is probably pot roast. Love how tender it gets, and not to mention the smell while cooking. My favorite slow cooker recipe is Carolina pulled pork! I am still learning to love the crockpot - would love these recipe books! Balsamic onion pot roast! So comforting with a glass of wine! I love my crockpot! Would love to win these books! When I moved into my new house and we were in the middle of a complete kitchen renovation, I decided the first meal I was going to make was Thanksgiving in the crockpot. Even though I had to wash the turkey breast in the bathroom sink, once it cooked with the stuffing, cranberries, and stock my kitchenless house smelled amazing! It's tough to choose just one favorite crockpot dinner...but I'll say my pot roast. Great giveaway! my absolute favorite thing to make in the crock pot is black beans. I make them and freeze them in can sized portions for a fraction of the cost and they're so much better for me because I know exactly what went into them! Pulled pork with a homemade BBQ sauce. We usually make a quick pulled pork torta when it's ready to go. Yum! Although there are several slow cooker dishes I love more, I have to say my favorite thing "to make" in the slow cooker is Red Beans & Rice. That's because using a slow cooker for this dish is so much easier and faster than the old fashioned method (soaking beans for a day, cooking them on stove-top for another day). Close runners up are pulled bbq pork, pot roast, and chili. The chicken stew with sausage and white beans is sooo good! I recently made a slow cooker chicken pot pie stew (from Allrecipes) and it was delicious! I'm already looking forward to making it again when the weather officially turns cool. I have a few Crock Pot meals I really like, but I think my favorite thing to make is a whole chicken. I put it in the Crock Pot, season it up, and let it go. Then I shred the chicken to use in other recipes, throw the scraps and bones back into the Crock Pot with some water and veggies and then I let it simmer away to make stock. SO easy, cost effective, and I get a lot of use out of that chicken and stock that took so little hands-on time to make! I would love to check out these books. Thanks for the chance to win! I love making pulled pork in the crock pot, nothing is easier!! During the winter, I love making my mom's homemade vegetable soup in the crockpot. It simmers for 24 hours, and smells soooo good all day long! I love Italian beef sandwiches in the crock pot. Our family loves a crock pot roast beef recipe from the Fix It and Forget It cookbook, but I'd love a new crock pot cookbook (or two) to try! I love the chicken and sausage stew and am hopefully making it again this weekend before we start destroying, I mean renovating, our kitchen. I need to use my crockpot more often, but I do like to make crockpot pulled pork with onions. Yum! my favorite crock pot meal has to be the 4 ingredient white bean chicken chili you posted! I used salsa verde and add some corn to make it 5 ingredient, but it couldn't be easier! I love to make French dip sandwiches made in the crockpot. I love making bbq pulled pork in the crockpot. I should use my crock pot more often! I usually make soup in the crockpot such as curried lentil or chili. kielbasa stew with lentils is my fave crockpot meal! My favorite crock pot recipe is barbecue chicken salad. The chicken cooks all day in barbecue sauce, then at the end of the day I shred it and put in on top of a tex-mex salad with romaine lettuce, fresh or frozen corn, avocados, green onions, black beans and blue corn chips. This is tossed with a lime and cilantro ranch dressing. Delicious and healthy! I like making spaghetti sauce! My favorite crock pot meal is pulled pork sandwiches. Easy Peasy! My family loves when we have slow cooker Italian Beef Sandwiches. It's a staple during the Fall and Winter months. I don't have a favorite slow cooker meal yet because I don't have a reliable slow cooker. But if I win this giveaway I'll finally go out and buy a new one. I love to make Wassail for the holidays. I love making pulled pork. Chicken Matzo Ball soup! FIxes all ailments and warms the tummy! I've been using the same recipe for years which has ingredients I don't use often ie: Turnips, celery root, rutabaga, leeks. The recipe was adapted from one of my favorite cook books by Marlene Sorosky. My favorite: Easy Crockpot chili: a pound of dried beans in the bottom of the pot; top with a pound of ground turkey, crumbled up; top with chopped onion, bell pepper, and celery (or use a frozen Cajun "trinity" blend) and your favorite chili spices (I use Wicke Fowler's chili blend). Cover with water by about 3 inches and cook on low. My favorite crock pot recipe is navy bean soup with bacon. Nothing beats coming home and knowing you've got some tasty soup waiting for you on a cold fall or winter day. French dip! I have the best recipe for it and the meat is always perfect and ready to go after a day at work. Carnitas! Yummy slow-cooked pork seasoned with garlic, cumin, chili powder. We then eat it in burrito bowls, crispy pan-fried burritos, and baked taquitos - yes, *those* creamy baked taquitos but with carnitas instead of chicken. SO GOOD! I love making Mexican Chicken Salsa! It is especially delicious over saffron rice with fresh cilantro and sour cream!! I only know how to make different chili recipes. I definitely need more recipes. We are huge chili fans, so any chili recipe in the crockpot is our go to meal! This is awesome! I love making my roasted tomato and caramelized onion sauce in my crock pot. I love making stuffed bell peppers in the crock pot. So yummy! I love making pulled chicken in the crock pot. It's the best! my favorite is roasting a chicken in the crock pot. Super easy!! I have a lot! Pulled pork, beef dip sandwiches, and salsa chicken. I love to make crockpot beef and broccoli! Salsa chicken, because it's SO easy and my whole family loves it. The loaded potato soup you have linked above became my favorite last winter. Right now I have pork tenderloin in the crockpot for pork tacos though. the chicken stew with sausage and white beans you listed above! The tomato soup in the first book is my new all time favorite. So much better than Campbell's. I'm gluten intolerant and have been able to make easy substitutions from their recipes. Pulled pork sandwiches have always been my favorite crop pot dish! I don't use my crockpot nearly as much as I should... but I love this chicken, salsa, cream cheese recipe served over rice! I make a chicken Marengo that is pretty tasy!! Chicken tomato sauce, wine, spices, olives, Parmesan cheese...nice to come home to! my favorite is just a chuck roast with cumin and a can of diced chiles. Cook all day and shred for delicious tacos. Beef Stew! Nothing makes me want winter to come faster then beef stew! We have so many favorites, but I'd say that salsa chicken tacos is my favorite. A close second would be your white chicken chili! Any kind of chili...easy and delicious! my new favorite is apple chutney over pork chops. So good! I'm a working mom of a toddler and I use my crockpot 3+ times a week. I love crockpot meals and I love America's Test Kitchen. It's hard to pinpoint my favorite crockpot meal, as we eat so many, but if I had to pick one, it would be the Sweet Barbacoa Pork by Skinnytaste. I have recently fallen in love with a chicken chili that takes 10 hours to cook. Just the right amount for how long I'm gone! Would love to win these books. My favorite thing to fix in my crockpot is corned beef, cabbage and potatoes. Easy and yummy! Thanks! I love a good pot roast from the slow cooker! Getting dinner ready with 3 hungry little people underfoot is my least favorite time of the day. I definitely need some crock-pot ideas! I love to make Chicken Taco Soup in the slow cooker! It's so comforting and warming this time of year (oh, and delicious!). Oh my, you are generous! I just pinned your Chicken Stew with Sausage and White Beans the other day. I love making chili in my crockpot. I am looking forward to more posts from these books - thank you so much! Pulled Pork. Super easy. Super delicious. Makes the house smell great. Beef Fajitas. Easy, delicious, and prepared the night before! i love to make beef dip sandwiches in the crock pot - so good! Hi! My husband and I love Chicken Taco Soup! So he makes it in the slow cooker, so good. Shredded BBQ chicken. It's so fast and easy, and I love that I can throw the chicken in while it's still frozen. Korean beef tacos are my favorite! Delicious! I love my apple cider chicken stew. Thank you for the chance!! Has to be Shredded BBQ Pork Shoulder made with Canada Dry Ginger-Ale. So delicious!!! Pulled pork bbq is the best! I recently started using my crockpot again and made an awesome black bean ragout in it! Instant favorite. Oh man - I love to make pulled barbeque chicken in my crockpot! But I'd love to expand my repertoire of crockpot recipes. I love making BBQ meatballs in the crockpot. My favorite is slow cooker chipotle beef, which I love to use in tacos! I love stew! Boring, I know, but it's so yummy. I'd love to try a new recipe. Pulled pork- so many different ways to use it as leftovers too! I love making Swedish Meatballs in my crock pot when I have to take something for a pot luck. I'd love some Ideas from a new cookbook. I LOVE Hearty Beef Stew. Delicious. apricot pulled pork! so yummy. Pork Thai Stew is our favorite! Chicken tacos: a jar of salsa, packet of taco seasoning and chicken breasts. I get asked for the recipe all the time and my family requests it over and over. 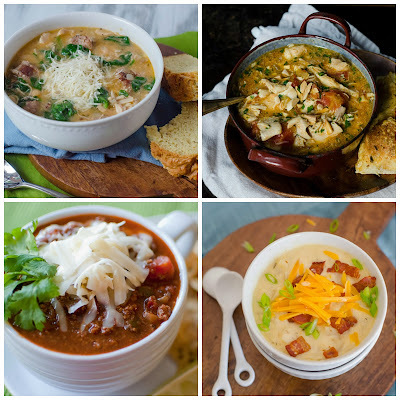 It's healthy, easy and delicious - the trifecta when it comes to crock pot recipes! So fun! I have a great creamed corn receipe that we use at the holidays! Happy to share if you like it! Chipotle chili - really great to come home to on a chilly day. Texas chili-just meat please-beans on the side. Love using the slow cooker. Great give away. Thanks Josie. I love crock pot lasagna! Chili in a crock pot is so easy! Citrus marinated pork shoulder, it can be used for so many things. Cuban sandwiches, taquitos, flautas, tacos, burritos and so on... yummy! Plus the left overs freeze great. roast with sweet potatoes, onions, and so on. yum! Completely obsessed with Smitten Kitchen's Black Bean Soup. And, my husband's chili. Spicy, belly-warming and full of good ingredients. Thanks for the suggestion of these two books! Love ATK so I imagine these books are tops. I am pretty inexperienced with crock pot cooking, so these cookbooks would be a great place to start! Favorite thing I've made so far is BBQ chicken. The dish that comes to mind is a corn & white bean chicken chili, with lots of lime juice & cilantro--mmm! Always a hit in our family and with our guests. Italian Drip Beef. For sure!! Hard to pick one, but I make a roasted vegetable soup with leftover vegetables and a rick bayless pork with tomatillos that we love in the slow cooker. I love BBQ pork in the slow cooker. I've got it going as I type! My favorite crockpot meal is Italian beef . I really like Braised Beef with Rosemary and Anchovies in the slow cooker. We love making a whole chicken in our crock pot, great flavor and wonderfully tender! I looooove slow cooker Tikka Masala. i love to make pulled pork in the slow cooker! My favorite slowcooker dinner is pot roast. I think my favorite is white chicken chili. My kids absolutely love my creamy chicken sandwiches that I make in the crockpot, so I guess I'll go with that. Pineapple Salsa Chicken is always a great one for me. It makes plenty to eat for several meals of burritos, nachos, bowls, tacos. I always put leftovers in the freezer. I just made Beef Stroganoff in my slow cooker yesterday. It was super good, and the leftovers--even better! I guess it's my new favorite crock pot recipe. Thank you for the generous giveaway. I love a good classic pot roast in the crock-pot---so easy and so good!